This recipe is now a celebrity. It made its debut when our sweet Vicky presented it on Greek TV two Sundays ago. 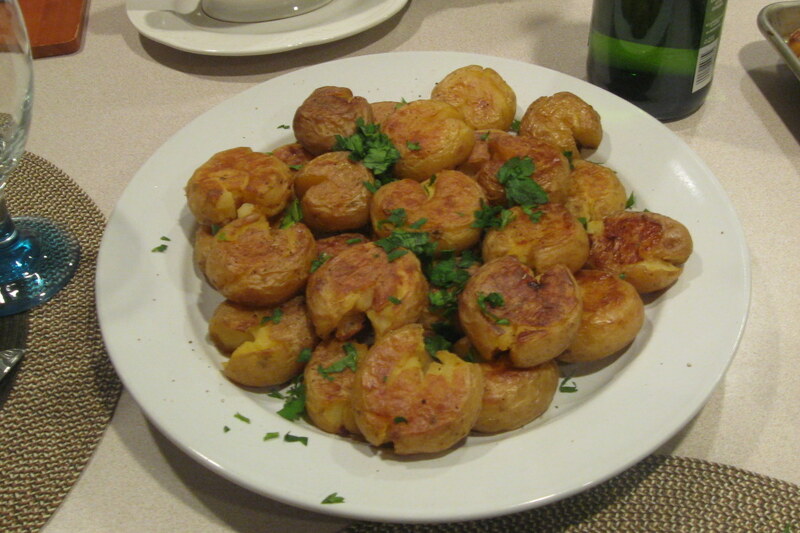 Baked potatoes with a “crushed” twist for extra crispiness. Their debut in our house was also on a Sunday. I cooked them for our special guests last Sunday and they were gone, gone. If you find nice and clean potatoes the recipe qualifies for busy weekdays. You boil them, crush them lightly with the bottom of a glass, coat with oil and bake. How to make: Brush the potatoes clean with a potato brush. Rinse them thoroughly. Boil them in salted water until they are soft to the fork. Drain the water and let them cool to the touch. Use the bottom of a glass to crush them very lightly. You don’t need to apply force. You push lightly and hear a “pop” as they crack. That’s enough and that’s all. You can oil them lightly with your fingers as per Vicky’s suggestion. What I did, instead, was brush the pan with oil generously, “wipe” the pan with one side of each potato, turn and “wipe” the other side. This is a quick an easy way to coat the potatoes with oil. Bake the potatoes in hot oven (200C/400F) for about 20 minutes, flip them over and cook for another 20-25 minutes until golden brown. Serve with extra salt, pepper, lemon zest and chopped parsley. Notes and tips: When you boil the potatoes be sure to add salt and make sure the water is ‘tasty’. Vicky said we should taste the water but I didn’t pay attention. Well, too bad. They do need a bit more salt so you won’t have to add too much when serving. If you are not counting calories, add cheese 5 minutes before they are ready for extra yumminess. The original title of this recipe was “Very special baked potatoes”. My kids, though, started referring to them as pac-man potatoes and the name stuck! Ευχαριστώ πολύ, Βίκυ μου, για τα καλά σου λόγια. Καλές γιορτές και σε σένα κι ευχές να λάμπεις πάντα.